The Madera Flea Market is committed to offering the best the San Joaquin Valley has to offer. The Flea Market is located on the Madera Fairgrounds close to Highway 99, with acres and acres of open space full of friendly vendors and anxious buyers. 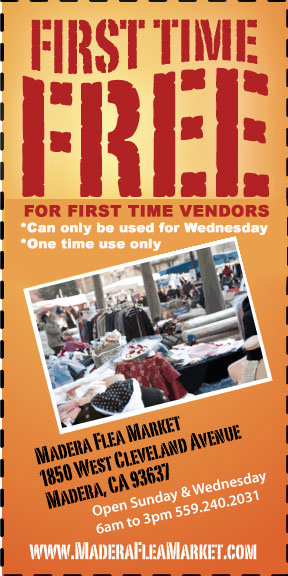 Make the Madera Flea Market your own “Stimulus Package.” We look forward to having you! The Madera Flea Market auctions spaces during the first week of the month if any are available. Vendors can pick up the auction applications from the office ahead of time. These auctions are a silent bid process and the contract is for one year only. After the year is up, the space will be placed for auction again. All new reservations will be taken during the second week of every month. So, every second Sunday and Wednesday new reservation maps are available. You can view the map at our office at 8 AM. It is first-come, first-served basis. We cannot save spaces for current/new vendors. Please have your Madera seller’s permit/insurance with current ID ready. We can not save a space for you if you do not have the correct paperwork. All spaces shaded grey are reserved, and the ones that are left white are available. If there is a space available for auction just ask for the application. The auction spaces are only made for the Main Aisle and are good for one year. If you are interested in selling food/beverage, please go to the Madera Environmental Health Department located at 200 W. 4th Street, Suite 3100 Madera, CA 93637. If you have any questions, please call our office at (559) 673-5800. You must also have liability insurance that covers up to one million dollars with Madera Flea Market listed as an additional insured set in this format: B.H. & Assoc. DBA: Madera Flea Market at Madera Fairgrounds 1850 W. Cleveland Ave. Madera, CA 93637. Disclaimer: It is against the law to sell, or offer, merchandise that is either counterfeit or has infringing logos/designs that violate copyright or trademark laws. Sale of food products must be licensed and approved by Madera County Department of Health and Flea Market Management. The sale or consumption of alcohol is strictly prohibited. Seller must have a resale tax number if selling more than once a year. Selling music tapes or CD’s, you must keep the volume at a reasonable level. No selling of pornographic material. All sellers must have proof of all items that they are offering for sale. Animals may not be sold. Selling firearms or ammunition is strictly prohibited. Violation of the above rules may result in removal from the swap meet grounds. Repeat offenders may be asked to leave permanently. Sellers must show proof of valid Driver’s License. Sellers need to show proof of a valid insurance. Bicycles, Skateboards, Skates, or Scooters cannot be ridden at the Flea Market grounds. Vendors must be packed and off the lot by 5 PM and cannot drive on/off the lot between 9 AM and 3 PM. By purchasing this license, the seller agrees to relieve the Madera Flea Market of any liability for bodily injury or damage to merchandise or property that may arise in connection of the sellers use of this space or that may arise with connection with the sellers activities at the Madera Flea Market and the seller agrees to defend and indemnify and hold the Madera Flea Market harmless against any claim or law suit that may be brought because of any injuries suffered or damaged caused by or in connection with sellers activities at the Madera Flea Market.